The study of pharmacology can overwhelm even the most seasoned healthcare professionals, with nurses in particular. It can be daunting task to familiarize yourself with heaps and volumes of information concerning the medications available. 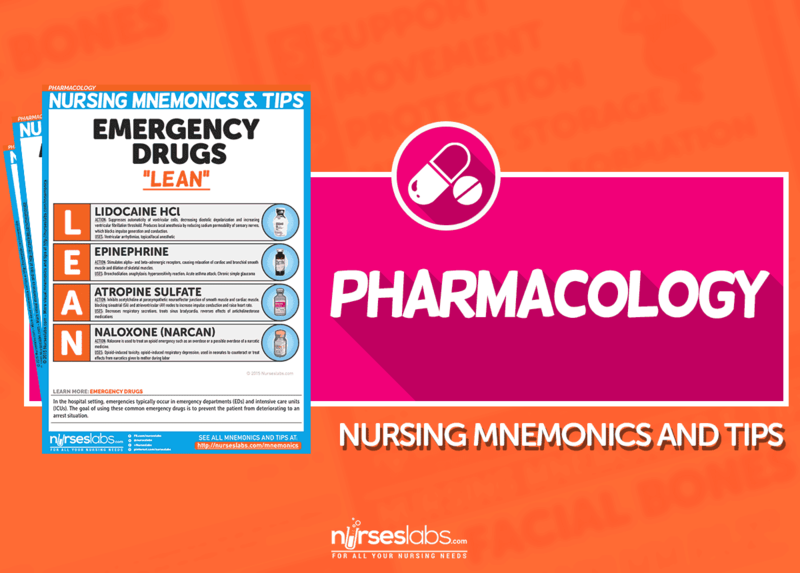 It is the goal of these nursing mnemonics to provide an easy quick-guide to simplify the concepts of pharmacology. Lidocaine is a class IB antiarrhythmic used as a second-line agent and after myocardial infarction. The therapeutic drug range for lidocaine is 1.5-5.0 mcg/mL. While generally safe, lidocaine can be toxic if administered inappropriately, and in some cases may cause unintended reactions even when properly administered. Lidocaine toxicity is seen at levels greater than 5 mcg/mL. 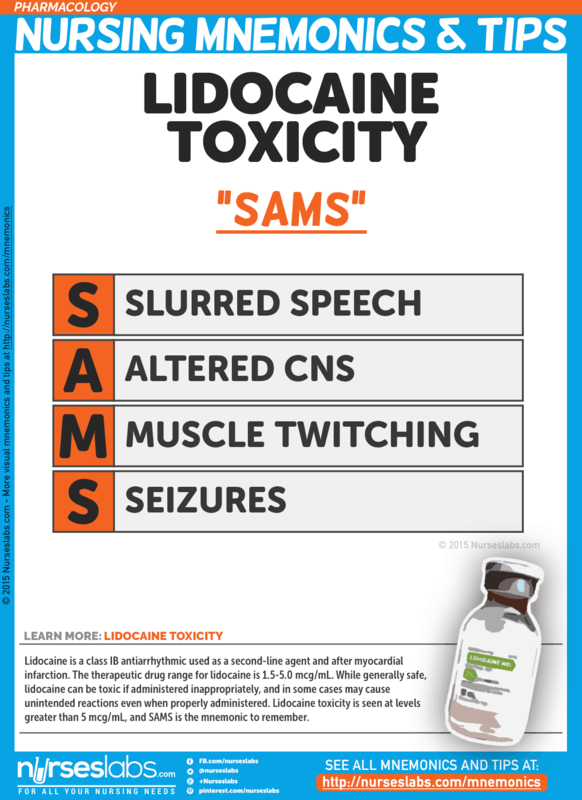 Remember the mnemonic SAMS for signs and symptoms of lidocaine toxicity. Nurses are primarily involved in the administration of medication across various settings. They are primarily involved in both dispensing and preparation of medication. Research on medical administration errors (MAEs) shows an error rate of 60%, 34% mainly in the form of wrong time, wrong rate, or wrong dose. 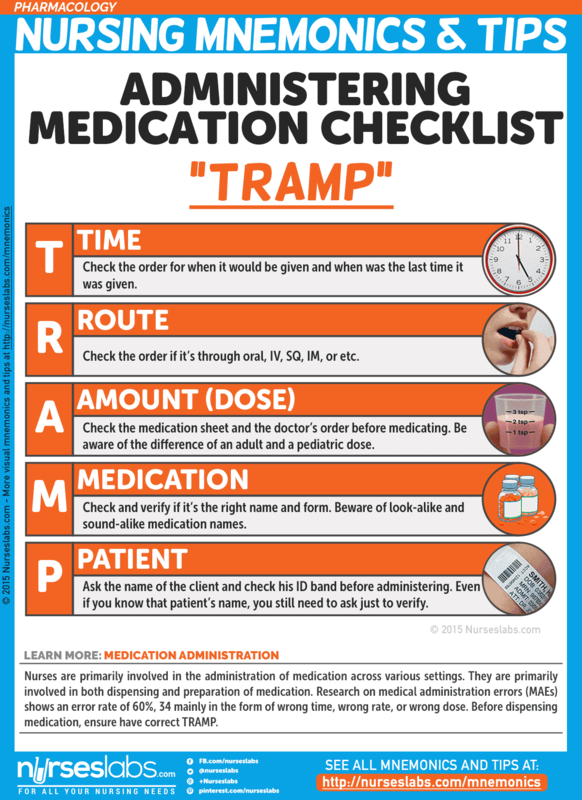 Before dispensing medication, ensure the correct TRAMP. See also the 10 rights of medication administration. Check the order for when it would be given and when was the last time it was given. Check the order if it’s through oral, IV, SQ, IM, or etc. Check the medication sheet and the doctor’s order before medicating. Be aware of the difference of an adult and a pediatric dose. Check and verify if it’s the right name and form. Beware of look-alike and sound-alike medication names. Ask the name of the client and check his/her ID band before giving the medication. Even if you know that patient’s name, you still need to ask just to verify. Some women experience side effects with “the pill” such as irregular periods, nausea, headaches, or weight change. 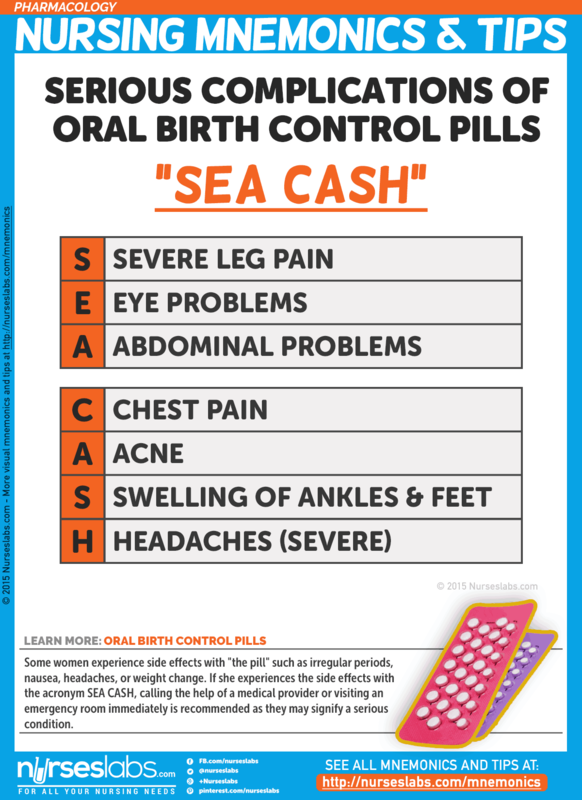 If she experiences the side effects with the acronym SEA CASH, calling the help of a medical provider or visiting an emergency room immediately is recommended as they may signify a serious condition. In the hospital setting, emergencies typically occur in emergency departments (EDs) and intensive care units (ICUs). 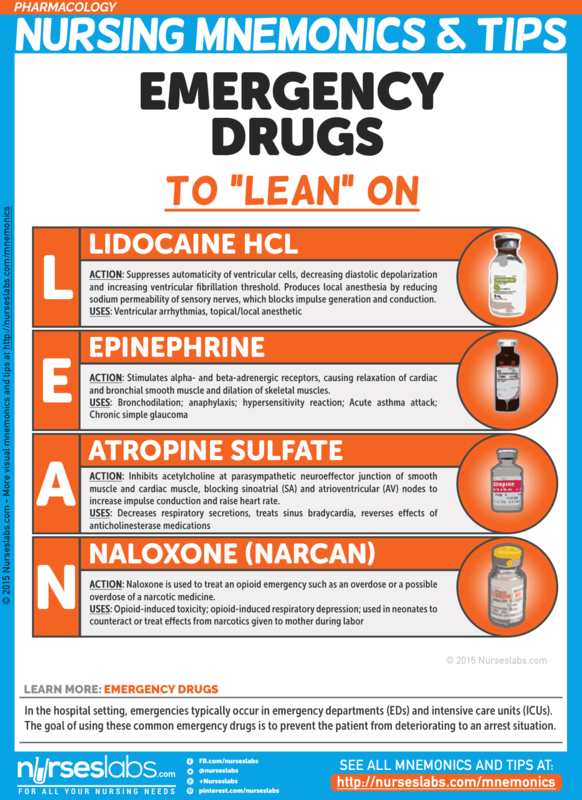 The goal of using these common emergency drugs is to prevent the patient from deteriorating to an arrest situation. Beta blockers reduce circulating catecholamine levels, decreasing both the heart rate and blood pressure. Typically, atropine is the drug of choice for symptomatic bradycardia. Antiarrhythmics and digoxin may also be used. Acts on beta2-adrenergic receptors, causing relaxation of bronchial smooth muscle; acts on beta1-adrenergic receptors in heart, causing positive inotropic and chronotropic effects and increasing cardiac output. Also lowers peripheral vascular resistance in skeletal muscle and inhibits antigen-induced histamine release. Causes norepinephrine release (mainly on dopaminergic receptors), leading to vasodilation of renal and mesenteric arteries. Also exerts inotropic effects on heart, which increases the heart rate, blood flow, myocardial contractility, and stroke volume. Stimulates alpha- and beta-adrenergic receptors, causing relaxation of cardiac and bronchial smooth muscle and dilation of skeletal muscles. Also decreases aqueous humor production, increases aqueous outflow, and dilates pupils by contracting dilator muscle. Thiazides affect the level of the nephron, inhibiting the reabsorption of sodium by the tubules at the cortical diluting segment of the nephron. The thiazides are the most commonly used oral diuretics and are widely used in the therapy of hypertension and congestive heart failure, as well as the treatment of edema due to local, renal and hepatic causes. 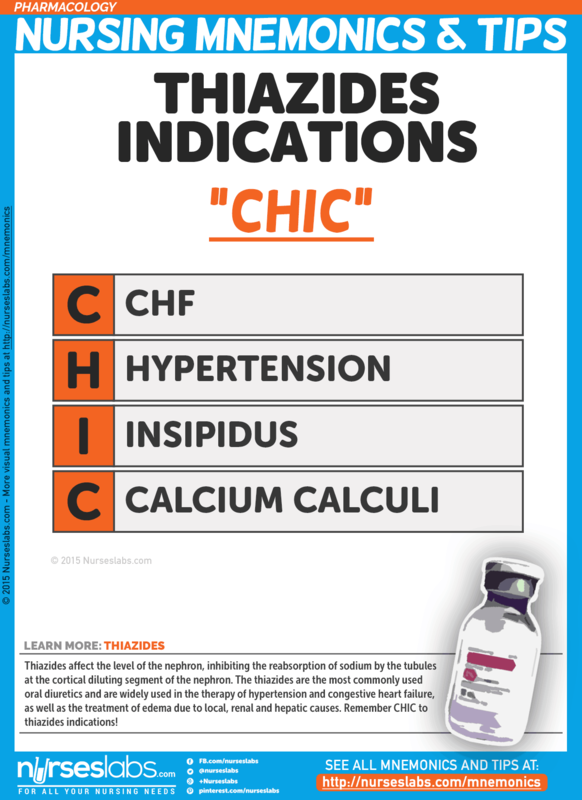 Remember CHIC to thiazides indications! There are many medications available to treat the symptoms of Parkinson’s, although none yet that actually reverse the effects of the disease. Most Parkinson’s disease treatments aim to restore the proper balance of the neurotransmitters acetylcholine and dopamine by increasing dopamine levels. It is common for people with PD to take a variety of these medications. 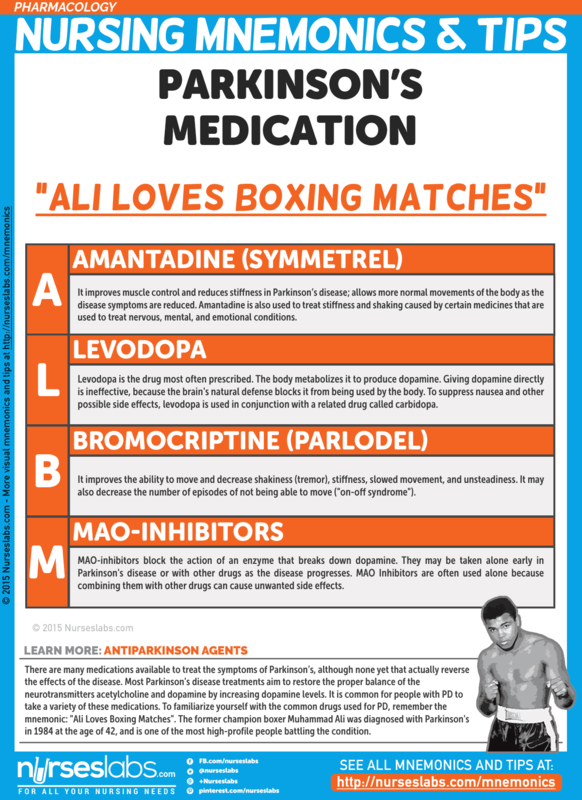 To familiarize yourself with the common drugs used for PD, remember the mnemonic: “Ali Loves Boxing Matches”. The former champion boxer Muhammad Ali was diagnosed with Parkinson’s in 1984 at the age of 42, and is one of the most high-profile people battling the condition. It improves muscle control and reduces stiffness in Parkinson’s disease; allows more normal movements of the body as the disease symptoms are reduced. Amantadine is also used to treat stiffness and shaking caused by certain medicines that are used to treat nervous, mental, and emotional conditions. Levodopa is the drug most often prescribed. The body metabolizes it to produce dopamine. Giving dopamine directly is ineffective, because the brain’s natural defense blocks it from being used by the body. To suppress nausea and other possible side effects, levodopa is used in conjunction with a related drug called carbidopa. It improves the ability to move and decrease shakiness (tremor), stiffness, slowed movement, and unsteadiness. It may also decrease the number of episodes of not being able to move (“on-off syndrome”). MAO-B inhibitors also block the action of an enzyme that breaks down dopamine. They may be taken alone early in Parkinson’s disease or with other drugs as the disease progresses. MAO Inhibitors are often used alone because combining them with other drugs can cause unwanted side effects. 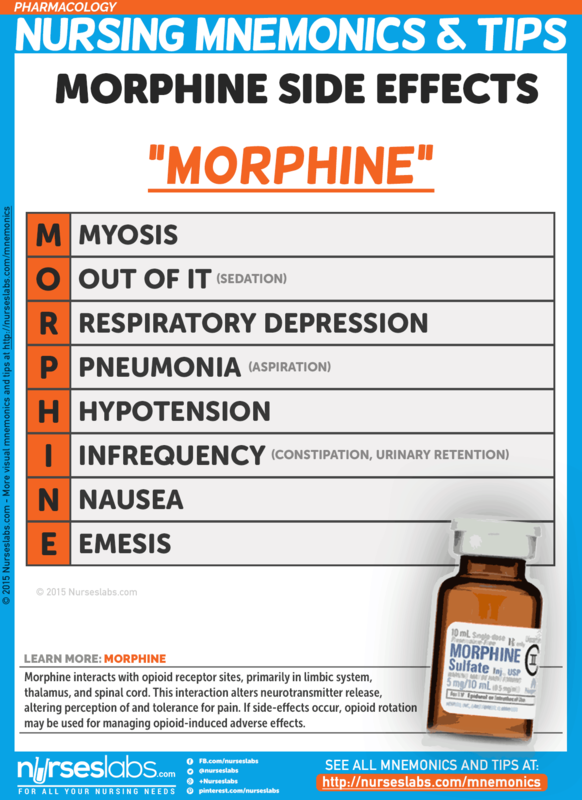 Morphine interacts with opioid receptor sites, primarily in limbic system, thalamus, and spinal cord. This interaction alters neurotransmitter release, altering perception of and tolerance for pain. If side-effects occur, opioid rotation may be used for managing opioid-induced adverse effects. Atrial fibrillation is the most common sustained atrial arrhythmia. A variety of medicines are available to restore normal heart rhythm. A beta-blocker, such as bisoprolol or atenolol, or a calcium channel blocker, such as verapamil or diltiazem, will be prescribed. Digoxin may be added to help control the heart rate further. 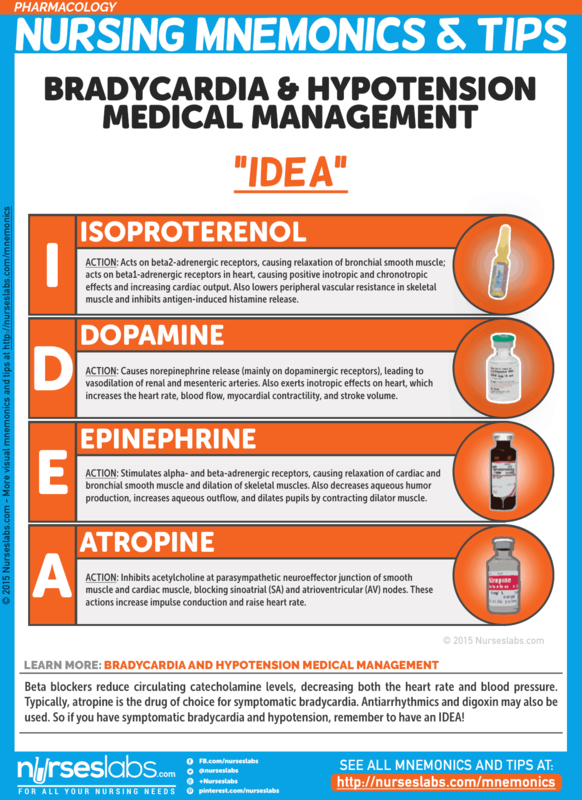 In some cases, amiodarone may be tried, or simply remember the mnemonic ABCDE. To block the effects of certain hormones on the heart to slow the heart rate. Help slow the heart rate by blocking the number of electrical impulses that pass through the AV node into the lower heart chambers (ventricles). Digoxin helps slow the heart rate by blocking the number of electrical impulses that pass through the AV node into the lower heart chambers (ventricles). A procedure in which electric currents are used to reset the heart’s rhythm back to regular pattern. Treatment for ventricular arrhythmias depends on the symptoms, and the type of heart disorder. Some people may not need treatment. If ventricular tachycardia becomes an emergency situation, it may require CPR and electrical defibrillation or cardioversion (electric shock). 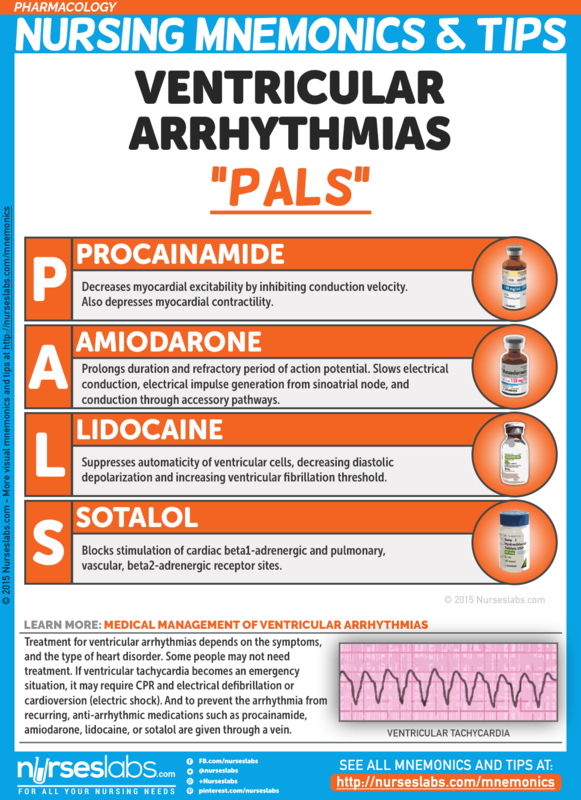 And to prevent the arrhythmia from recurring, anti-arrhythmic medications such as procainamide, amiodarone, lidocaine, or sotalol are given through a vein. Decreases myocardial excitability by inhibiting conduction velocity. Also depresses myocardial contractility. Prolongs duration and refractory period of action potential. Slows electrical conduction, electrical impulse generation from sinoatrial node, and conduction through accessory pathways. Suppresses automaticity of ventricular cells, decreasing diastolic depolarization and increasing ventricular fibrillation threshold. 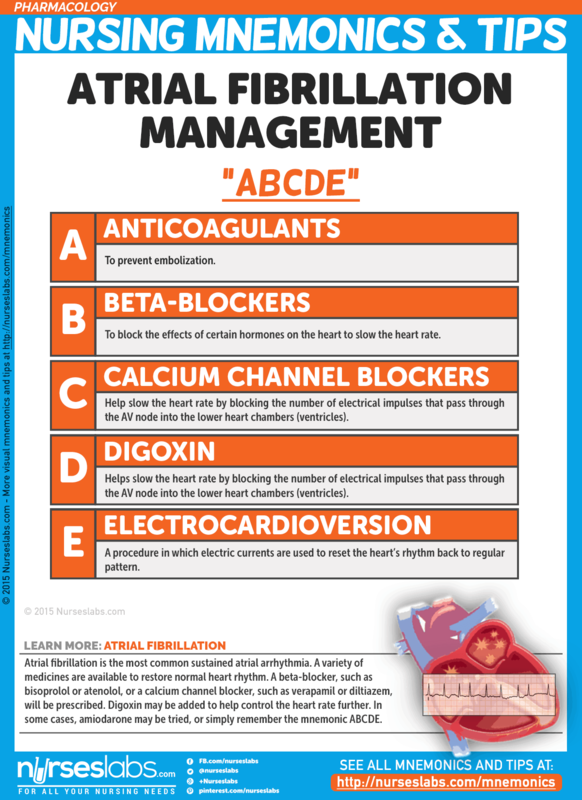 Blocks stimulation of cardiac beta1-adrenergic and pulmonary, vascular, beta2-adrenergic receptor sites. This action reduces cardiac output and blood pressure, depresses sinus heart rate, and prolongs refractory period in atria and ventricles. Know a few witty nursing mnemonics? If you some mnemonics about this topic, please do share them at our comments section below! Else, there are more nursing mnemonics here. augusta registered nurse since 2018. this was rather helpful.